Desmuslin is an α-dystrobrevin-interacting protein expressed primarily in heart and skeletal muscle. The desmuslin protein interacts with and is closely related to desmin, a protein encoded by a locus mutated in some forms of hereditary distal myopathy. As a muscle-specific intermediate filament protein, desmuslin is also a candidate for myopathies of unknown etiology. The desmuslin gene was localized to chromosome 15q26.3 by electronic screening of the human DNA sequence database. Primer pairs were designed to amplify the 5 exons of the desmuslin gene in 11 overlapping DNA segments. The desmuslin gene was screened for mutations in 71 patients with various forms of myopathy for which there was no known cause. In this analysis, 10 common and 2 rare amino acid altering single-nucleotide polymorphisms were identified, all of which were seen in a control population of individuals thus making these unlikely causes of the phenotype. Interestingly, one of the single-nucleotide polymorphisms found in a patient resulted in a premature stop codon in the first exon. The nonsense mutation was also detected in the patient's unaffected father and one unaffected control; it was detected in 0.44% (2/454) of unrelated chromosomes and is therefore predicted to have a homozygous frequency of 0.002%. No causative mutations were found in the desmuslin gene. However, the single-nucleotide polymorphisms mapped in this study represent a well-mapped group that can be used for disequilibrium studies of this region of chromosome 15q26.3. Dystrophin and its associated proteins are thought to be involved in the anchoring of the muscle cell membrane to the extracellular matrix , and the absence of many of these proteins can lead to the phenotype of muscular dystrophy . The dystrophin-associated protein complex (DAPC) consists of several subgroups of protein complexes, each associated either directly or indirectly with dystrophin. The sarcoglycans are four transmembrane proteins  that are organized by a fifth protein called sarcospan . This complex is thought to be involved in signalling at the cell membrane . A second subcomplex, known as the dystroglycan complex , interacts directly with dystrophin in the cytoplasm and laminin in the extracellular matrix, thus providing a structural link between the inside and the outside of the cell. A third subcomplex involves the dystrobrevins [7, 8] and syntrophins  which form a complex at the C-terminal region of dystrophin [10,11,12] and have an as yet unidentified function. Desmuslin (DMN) was recently identified as an α-dystrobrevin-interacting protein via the yeast two-hybrid method . Both desmuslin mRNA and protein are expressed primarily in cardiac and skeletal muscle and the gene encodes a novel intermediate filament (IF) protein of 1253 amino acids. Electron microscopic analysis shows that desmuslin colocalizes with desmin, another muscle IF protein. Co-immunopreciptation experiments revealed that the desmuslin and α-dystrobrevin interaction involves the region of protein encoded by exons 8-16 of α-dystrobrevin and domains 1A through 2A of the desmuslin rod domain. Desmuslin is hypothesized to function as a mechanical support to the muscle myofibers by making a previously unrecognized linkage between the extracellular matrix via the DAPC and the Z-discs through desmin and plectin . As several IF proteins, including desmin, have been implicated in human genetic disorders such as dominant and recessive congenital and adult onset myopathies [15,16,17,18], desmuslin becomes a candidate to be involved in myopathies as well. Supporting this is the exclusive expression of DMN in skeletal and cardiac muscle. The DMN gene was analyzed for mutations in 71 patients with various forms of muscular dystrophy and myopathy. In addition to 9 single-nucleotide polymorphisms (SNPs) that do not change the protein sequence, we identified 12 SNPs that do alter the residue they encode. Although examination of controls has shown that none of them is likely to cause the phenotype, our results are useful for future disequilibrium studies of this region of chromosome 15q26.3 and for mutation analysis and association studies in other genetic disorders. Using the DMN cDNA sequence (AF359284) as a query to blast the public human genome database, we found a genomic clone (AC018999) that included the entire desmuslin coding sequence. The alignment identified 5 exons which are schematically indicated in Figure 1. Eleven sets of primer pairs were developed to amplify the 5 exons and the flanking intron sequences (Table 1). The primers were designed to amplify overlapping segments of the desmuslin coding sequence as indicated in Figure 1. Schematic representation of the desmuslin gene and protein. Desmuslin protein structure, genomic organization, approximate location of SNPs identified in this study and primer pairs used to amplify the entire coding sequence are indicated. A comparison of the DMN cDNA sequence with its related genomic DNA led to the identification of 5 exons ranging from 71 bp (exon 3) to 2447 bp (exon 4). The exact start of transcription in exon 1 and the termination of transcription at the end of exon 5 are unknown. Unlike the brain DMN cDNA, muscle DMN cDNA does not contain the sequence between exons 4 and 5 (indicated by an open box). The locations of the 21 SNPs are indicated by arrows; the 12 SNPs that alter an amino acid codon are shown in red and the 9 silent SNPs are shown in black. The exact position of each of the SNPs is described in Table 3. The positions of the 11 primer pairs are also shown below the respective exons. Eleven PCR primer sets that allow the amplification of the entire coding sequence and surrounding intronic sequence of the DMN gene. Desmin, a desmuslin-interacting protein, has been implicated in hereditary distal myopathies implying that desmuslin itself may also be involved in myopathies of unknown etiology. DNA samples isolated from 71 dystrophic and myopathic patients (as described in Table 2) were analyzed by direct sequencing to determine whether the phenotype was the result of a desmuslin mutation. All observed variants were subsequently tested in ≤ 156 control individuals. These analyses revealed 10 common and 2 rare SNPs [19, 20] that alter an amino acid codon; 7 result in non-conservative amino acids changes (Table 3). Summary of clinical diagnoses and pathological findings of patient samples studied for alterations in DMN. Summary of SNPs in theDMN gene. The details of 21 SNPs are shown. The exon and domain location as well as the nucleotide and amino acid positions of SNP are given. Also listed are the major and minor alleles, both as nucleotide and amino acid, and the corresponding frequencies, in terms of numbers of chromosomes and percentage. The nucleotide substitution is highlighted in bold. The amino acid change indicates the degree of alteration in the encoded residue; the change is described as none if there was no change, conservative if the alteration does not change the residue's polarity or charge, and non-conservative if the polarity and/or charge of the encoded residues differ. None of the SNPs seem associated with the patient phenotypes as each was also found in the control population. Nine silent SNPs, which did not alter an amino acid, were also identified in the patient population; several of these SNPs showed a high degree of heterozygosity. Most were tested for and detected in the control population, thus making desmuslin an unlikely candidate to be involved in these myopathies, but this first pass can be followed by others in a larger set of patient samples. Interestingly, SNP 3, a C598T substitution resulting in a premature stop codon in exon 1, was detected in a single Nemaline myopathy patient. Neither the proband's mother nor any of the other patients was found to carry this mutation (Figure 2A). The C598T mutation removed a Pvu II site, thus permitting detection of the alteration by restriction digest analysis of a PCR product generated from genomic DNA. The assay is outlined schematically in Figure 2B and documented in Figure 2C. 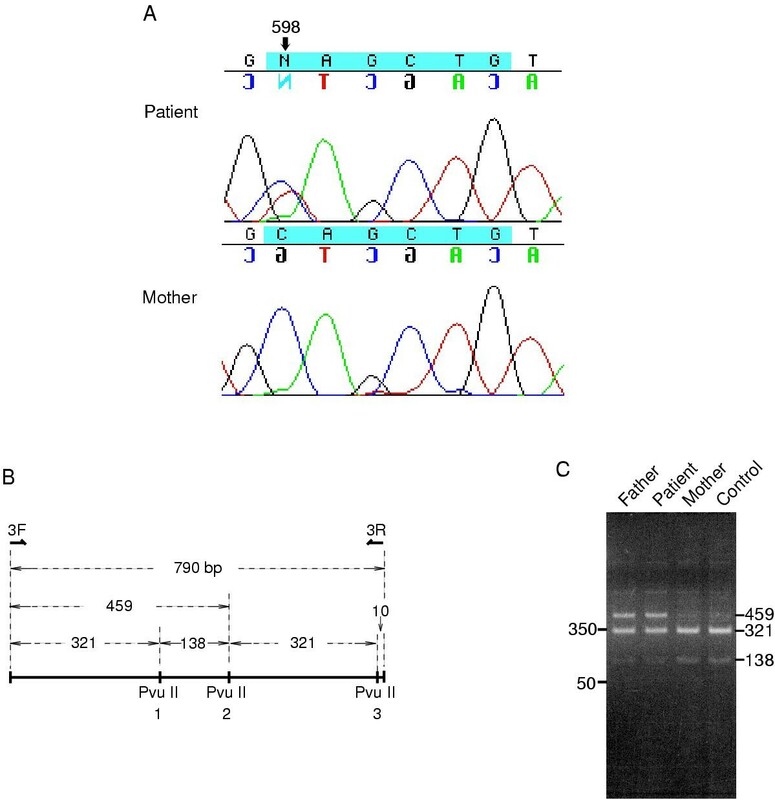 Using this Pvu II assay, the C598T change was detected in the unaffected father of the patient, making it unlikely that heterozygosity for the C598T change is the causative mutation in the myopathic proband. Analysis of SNP3 (C598T) in patient and control samples. (A) Sequence results of the C598T patient and his mother. At nucleotide number 598, the patient has a C and T, indicated by N. The patient's unaffected mother is homozygous for C. (B) Pvu II site amplified with 3F and 3R. The size of PCR product amplified with 3F and 3R is 790 bp and contains three Pvu II restriction sites. When the PCR product from a control subject is digested with Pvu II, four products of 321 bp, two of 138 bp and two of 10 bp are generated. Since the C598T removes the first Pvu II restriction site, digestion of the amplification product will produce a fragment of 459 bp instead of 321 bp and 138 bp. (C) Electrophoresis of PCR product digested with Pvu II shows that the patient and his unaffected father both have a band of 459 bp. The 138 bp fragment in the mother and control is twice as strong as those of the patient and the father. Similarly the 321 bp band in the mother and control is stronger than in the patient and his father. The removal of the Pvu II site allowed rapid screening of additional patients and control samples by DNA amplification of the region and subsequent digestion of the PCR product with Pvu II. One of 312 control chromosomes was found to have lost the Pvu II site, and the heterozygous presence of the C598T mutation was confirmed by DNA sequencing of the PCR product. Thus it is likely that the C598T mutation is not responsible for the myopathic phenotype of the proband. This is a surprising result considering that a single copy of this stop codon is present in 0.44% (2/454) of the population and 0.002% of the population is predicted to carry this nonsense mutation in a homozygous state. The phenotype of the latter individuals is not known. There is the possibility that either the heterozygous C598T DMN mutation combined with another mutation in a different gene or the C598T in a homozygous state causes muscular dystrophy or myopathy of unknown genetic pathogenesis. The C598T DMN mutation is a good candidate to be a modifier for muscular and/or cardiac phenotypes, considering: (i) the frequency of the mutation in the normal population in the heterozygous as well as homozygous state; and (ii) the key role of desmuslin in connecting the Z-discs to the extracellular matrix. The desmuslin SNPs should be examined in a larger set of myopathy and muscular dystrophy patients to test this hypothesis. More specifically, it should be determined whether there is a statistically significant difference in the frequency of individual or clustered SNP haplotypes between the patient and the control populations. The desmuslin coding sequence is highly polymorphic with 9 SNPs that do not alter an amino acid and 12 that do. Ten of these variations have minor allele frequencies that are represented in over 10% of the chromosomes sampled. These 10 are spaced within a genomic interval of ≤ 28 kilobases, or approximately 1 per 2800 bases. These highly informative markers are thus very useful for genetic analysis. The presence of so many SNPs within the coding sequence of a protein is somewhat unexpected and is much greater than that documented for other genes. This degree of variability may reflect a redundancy of desmuslin at the Z-line where other IF proteins with potentially overlapping functions are located . The characterization of the individual components that form protein complexes in skeletal muscle and heart, especially information concerning genotype-phenotype correlations, will increase our understanding of the pathophysiology of human muscle diseases. We encourage other groups to test for the presence of the C598T DMN mutation in their human patient samples affected by muscular and cardiac diseases. The generation of desmuslin null animal models will also contribute to the understanding of the role of this protein in muscle and cardiac disease. Blood samples were obtained from patients and control subjects under IRB-approved informed consent. The genomic DNA extracted from these blood samples was used as the template for the PCR assay. Using an Advantage-GC cDNA PCR polymerase (Clontech) and Pfu DNA polymerase (Stratagene), PCR was carried out with primers specific to the exon and/or intron of DMN sequence (Table 1) under the following conditions: 94°C for 1 min followed by 35 cycles of 94°C for 1 min, 57-59 °C for 1 min, 72°C for 3 min and a final extension time of 10 min at 72°C. The amplification products were purified using the QIAGEN PCR purification kit and analyzed on either an ABI 373 or 377 automated sequencer with fluorescent dye terminator chemistry (Applied Biosystems). The PCR products were also digested with Pvu II and Msp I in order to screen for the C598T and C2836T SNPs, respectively. The authors would like to thank Corinne Strickland for assistance in identifying appropriate patient samples and the members of the Children's Hospital - Genetics Department Sequencing Facility which is supported by an MRRC Grant (NIH-P30-HD18655. AHB is supported by the Muscular Dystrophy Association of the USA, the Joshua Frase Foundation and grants AR44345, and AR02026 from the NIAMS of NIH. YM, AAP and LMK are supported by the Howard Hughes Medical Institute. LMK is an investigator of the Howard Hughes Medical Institute.